Tectonic processes represent surface geological processes derived from stresses within the top surface of a planet. There are two areas on Mars that have experienced major crustal up-warping. They are the Tharsis region and the Elysium region (see volcanic process for their locations). The up-warp of Tharsis is over 4000 km wide and the vertical deformation exceeds 6 km. This was probably produced by mantle processes such as solid-state mantle convection. Because of the large-scale up-warping at Tharsis, fracture systems either radial or concentric to the Tharsis bulge are visible (Figure 7.1). 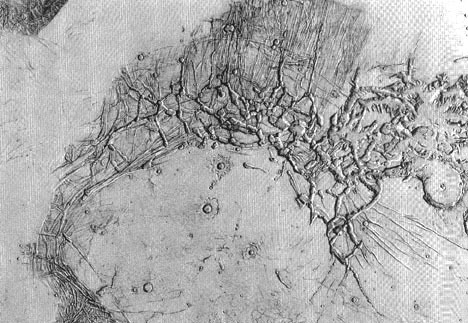 This is a network of interconnected grabens centered on the non-volcanic part of the Tharsis uplift and next to the western edge of the Valles Marineris. It is clear that the older, north-trending fractures were overlaid by the younger, more chaotic system. Figure 7.2 is a close-up view of an area where troughs are clearly visible.